Merganser Kennel is located on 70 acres south of Eugene, Oregon. We have three ponds, one of which is one of the most technical ponds for retriever training in the state. Our facility is used by many friends and retriever clubs for dog training activities. 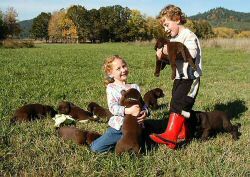 We raise and train Labrador Retrievers for our own enjoyment so do not train or board other people's dogs.